Before making such conclusions, let's consider this issue in more detail and make a retrospective journey into the history of the matter. According to statistics, the most widespread aspect ratio of computer monitors in recent years is 16:9. 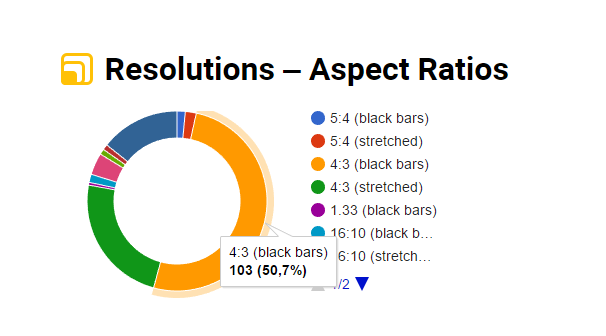 As for the resolution, the most common is 1366x768 pixels for laptops and 1920x1080 for desktop displays. This aspect ratio took the lead back in 2012. It has completely ousted the 16:10 ratio, which in turn has done the same with the 4:3 and 5:4 ratios. Why did the industry eventually come to the 16:9 aspect ratio? This is a story of its own, which is very interesting, for which we can make a dedicated video or post in a blog. But we are not talking about this now. The first version of the Counter-Strike game first emerged in 2000, with the Counter-Strike Source title launched in 2004. Just when the 4:3 aspect ratio was the most common so it is CS:GO native resolution. Although monitors with the 16:10 aspect ratio first appeared in 2003, they gained popularity only by the end of 2000, by the time when all manufacturers began a transition to 16:9. Professional gamers that greatly contribute to this statistics in their vast majority did not start with playing CS:GO, but 1.6 or Source instead and in those days when 4:3 displays were very much widespread. The players got accustomed to such an aspect ratio and most of them still continue playing the way they got used to and find it more convenient. However, each aspect ratio has its peculiarities. The first and main peculiar feature of this aspect ratio is a wider FOV, which is a field of view. The second feature is a clearer picture, in case, of course, if this aspect ratio is native for your display. The third feature follows directly from the previous one. As this aspect ratio usually implies a higher Counter Strike resolution it causes a higher load on your PC. The main distinctive feature is very controversial, but somehow, due to the fact that the image is clipped around the edges, your attention is not so distracted and it becomes easier to focus on the center of the screen. Whether it is true, it has not been ascertained yet. Most likely, like a number of some other things, this peculiarity does not turn out to be true for everyone. The second feature as well as with the 16:9 aspect ratio directly follows from the previous one. A smaller resolution imposes a lower load on the video subsystem of your PC, though sharpness and discernibility of objects on the screen decrease accordingly. What makes this option different from the previous one is the absence of focus on the center of the screen. However, due to a stretching effect, player models become much wider. This makes the aiming easier, but as the picture expands with the number of software pixels remaining the same, the models on the screen move faster, thus automatically making the aiming harder and compensating for the bonus of increased model width. Though this compensation may not be accurate as your crosshair moves just as fast. There are the advantages and disadvantages of choosing this aspect ratio type that counterbalances themselves. It's a matter of personal preference. The experience of playing in a 16:9 aspect ratio. The first thing in this mode player models move slower. It's more comfortable to aim this way. Although a lot of people for whom the 16:9 option makes the game too slow and dull. It is purely a matter of taste. Well, the third distinction lies in the same consistently smaller number of pixels and its impact on your system performance. And again it strongly depends on your PC. You will hardly feel any difference in performance with a powerful PC. But when running the game on an old computer, lowering the resolution can add a couple of lacking FPS. A distinctive feature of this aspect ratio is its compromise nature. Due to this reason, the picture remains clearer and it is much easier to make out what is happening in a frame. Before I bought a 144Hz monitor about a year ago, I've been playing with a 16:10 ratio (stretched) for several years. I honestly even felt a desire to play in this aspect ratio again. Perhaps, I will do it. What is to choose is for you to find out. As you may already see, there is no aspect ratio that is objectively the best, they are just different. With its pros and cons, and that is a pro for one gamer, may as well turn out to be a serious con for another. Therefore, you should try them out and choose the option that you find most comfortable. The higher the resolution, the higher the image definition is as well as the load on your PC. What does it mean? 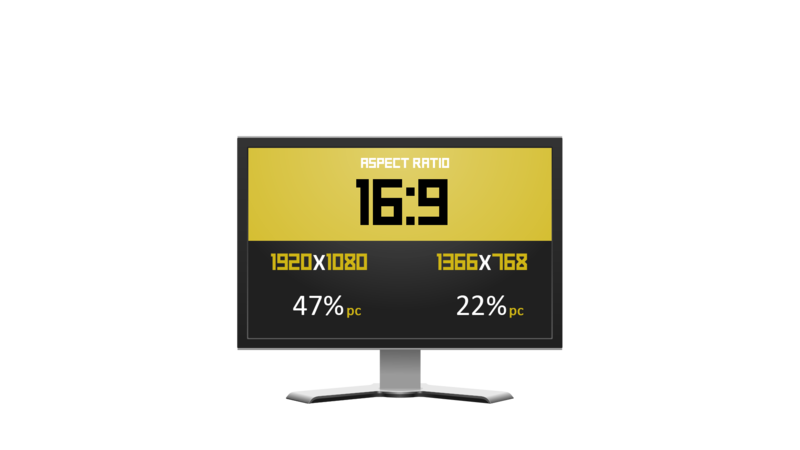 This means that if you, for example, prefer the 16:9 aspect ratio, and the performance of your PC allows you to play the game at the maximum resolution available on your monitor without losing a significant number of FPS, then there is absolutely no point in reducing it. Another thing is when you have a low-performance PC and reducing the resolution significantly increases the number of FPS, then yes, certainly the FPS is more important than the image definition. Although I dare to assume that there are people who play at 800x600 resolution on the most powerful rigs, simply because they like it, well, or as they just got used to it. Nevertheless, as for choosing the resolution for all newcomers, I would recommend you to base upon the capabilities of your hardware only and do not reduce the resolution if it does not increase the FPS for you. Doing otherwise makes no sense at all.